Since my last weigh in I'm felling really down about my current ability to lose any more weight. I know that I need to just hang in there that it will start coming off again. But it is sometimes hard when my schedule gets all screwed up! I haven't been able to walk since Monday. Tuesday the hubby was running errands preparing for his fishing trip the next morning and then Wednesday he was working late. I feel like a lump and I don't like it. I NEED ENCOURAGEMENT! Anyone out there have any for me? 2 Comment Here ~ Motivate Us! Not a good week for me here. I only walked 3 days and I fell off the wagon on Friday when I drank a little too much and ate POLLO TROPICAL! Not Good! Not one ounce lost! Exactly the same. And I'm disappointed in myself! But I'll get over it, move on and this week will be better! And..... 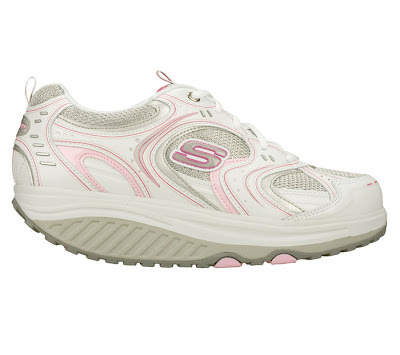 I'm excited that I will be getting a pair of Sketchers Shape~Ups from the best parents in the WORLD!